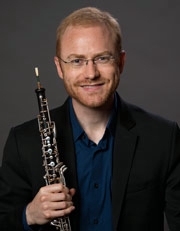 Dwight Parry is principal oboist of the Cincinnati Symphony Orchestra and has been an Adjunct Faculty member at CCM since 2015. Previously, he was the principal oboist of the San Diego Symphony and was a fellow with the New World Symphony. Parry has performed as guest principal with groups including the New York Philharmonic, the Chicago Symphony, the San Francisco Symphony, the Atlanta Symphony, the Los Angeles Opera and the Deutsche Symphonie of Berlin. Originally from coastal Southern California, he found his passion for music studying piano, voice and jazz saxophone. It was not until late in high school, however, that he began playing the oboe and truly found his calling. He studied at the Cleveland Institute of Music with John Mack and at the University of Southern California with Allan Vogel and David Weiss, a gentleman who also taught him to surf. Parry performs and teaches internationally in concertos, recitals, master classes and chamber music. Past appearances have featured the works of Mozart, Goossens, Haydn, Bach, Strauss, Vivaldi, Albinoni, Barber and Marcello. He was recently the featured soloist in Mexico City for Vaughn-Williams' wonderful concerto for oboe. This season, he will be the soloist for The Flower Clock by Jean Francaix with the Ohio Valley Symphony. He will also perform the Strauss Oboe Concerto for his third subscription solo appearance with the Cincinnati Symphony. In addition to his position at CCM, Parry is an Adjunct Faculty member of Northern Kentucky University. He also teaches privately and gives master classes at schools and festivals throughout the year. When he's not holding an oboe, you'll often find Parry in the audience for local concerts and plays, including Broadway, jazz and bluegrass as well as opera and symphony performances. He spends the rest of his time hiking, running, volunteering, tossing frisbees, reading and creating curiosities in the kitchen. Parry is a Loreé artist and performs exclusively on Loreé oboes. Learn more about Dwight Parry by visiting www.dwightparry.com.